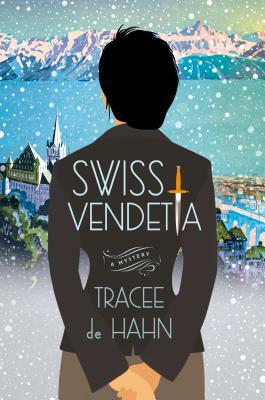 Swiss Vendetta, Tracee de Hahn's mesmerizing debut, is an emotionally complex, brilliantly plotted mystery set against the beautiful but harsh backdrop of a Swiss winter. Inspector Agnes Lüthi, a Swiss-American police officer in Lausanne, Switzerland, has just transferred to the Violent Crimes unit from Financial Crimes to try to shed all reminders of her old life following her husband's death. Now, on the eve of the worst blizzard Lausanne has seen in centuries, Agnes has been called to investigate her very first homicide case. On the lawn of the grand Château Vallotton, at the edge of Lac Léman, a young woman has been found stabbed to death. The woman, an appraiser for a London auction house, had been taking inventory at the château, a medieval fortress dripping in priceless works of art and historical treasures. Agnes finds it difficult to draw answers out of anyone—the tight-lipped Swiss family living in the château, the servants who have been loyal to the family for generations, the aging WWII survivor who lives in the neighboring mansion, even the American history student studying at the Vallotton château's library. As the storm rages on, roads become impassible, the power goes out around Lausanne, and Agnes finds herself trapped in the candlelit halls of the château with all the players of the mystery, out of her depth in her first murder case and still struggling to stay afloat after the death of her husband. TRACEE DE HAHN completed degrees in architecture and European history at the University of Kentucky and then lived in Europe, including several years in Switzerland. She currently lives in Virginia with her husband, a Swiss architect, and their Jack Russell Terriers. Swiss Vendetta is her first novel.